The University of British Columbia’s Okanagan campus is home to the newest Okanagan Regional Library location. The pocket public library – “about the size of an executive corner office,” estimates UBCO chief librarian Heather Berringer – opened in November, complete with a small collection of books, a computer terminal for ORL catalogue searches, a self-checkout kiosk, and shelving where patrons can pick up and drop off requested items. ORL staff come to campus once a week to refresh the collection, deliver holds, check in returned items, issue public library cards and help clients access ORL’s online resources. The pocket library closes the loop on a reciprocal agreement between the two library systems that started with the 2015 opening of UBCO’s Innovation Library, a staffed branch within ORL headquarters in downtown Kelowna. “We have a lot of students on experiential learning assignments, on co-op, we have students who work downtown, and it gives them a place to access the resources and to get help from a librarian,” Ms. Berringer says. She notes that it’s also been well used by locals interested in genealogy, historical research, market research, and by staff from nearby government offices and agencies. 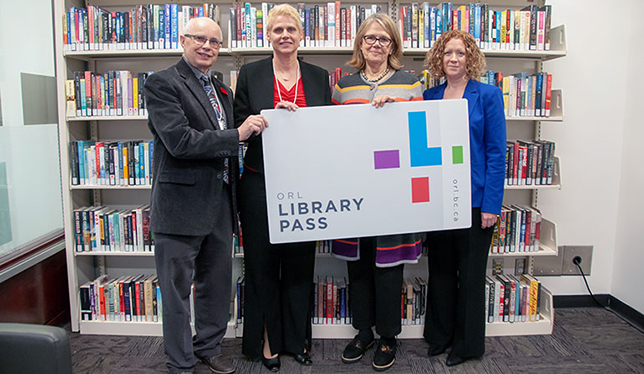 Don Nettleton, far left, and Monica Gaucher, both with the Okanagan Regional Library, present UBC Okanagan’s Deborah Buszard her own library card. Also pictured is UBC Okanagan Chief Librarian Heather Berringer. Photo courtesy of UBC Okanagan. Under the reciprocal agreement, each system is offered dedicated space in the other to operate a small outpost with no leasing or rental costs. UBCO and ORL entered into the partnership to leverage each other’s strengths and avoid duplicating resources in a time of shrinking budgets. “Quite honestly, we were spending our collection dollars on [a popular reading collection] because students indicated an interest in – and a need for – some leisure reading,” Ms. Berringer says. By teaming up with ORL, university librarians can now point clients to a wider selection of reading material as well as to ORL’s digital collection, which includes streaming video and music services, online learning platforms, and databases of newspapers and magazines from around the world.